New York State Lt. 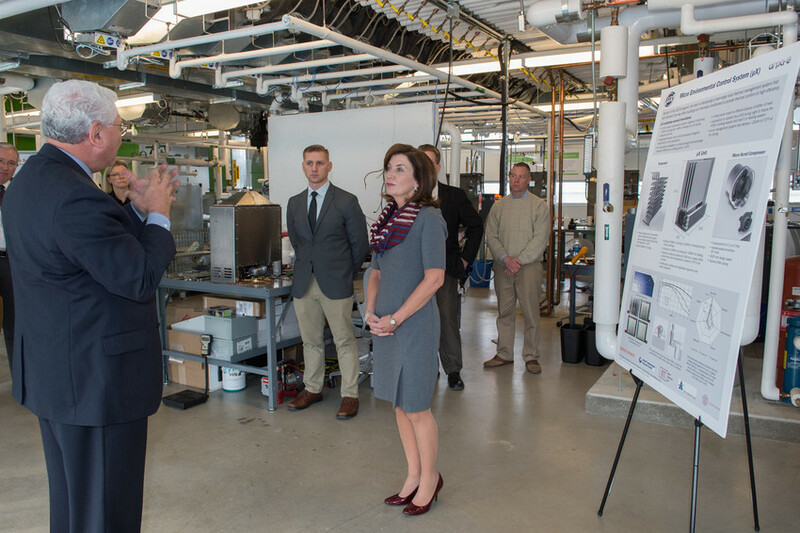 Governor Kathy Hochul visited the Syracuse Center of Excellence in Environmental and Energy Systems (SyracuseCoE) again on Tuesday, December 13, to take a tour of the building and labs and learn about ongoing projects to study human health and performance in indoor environments. 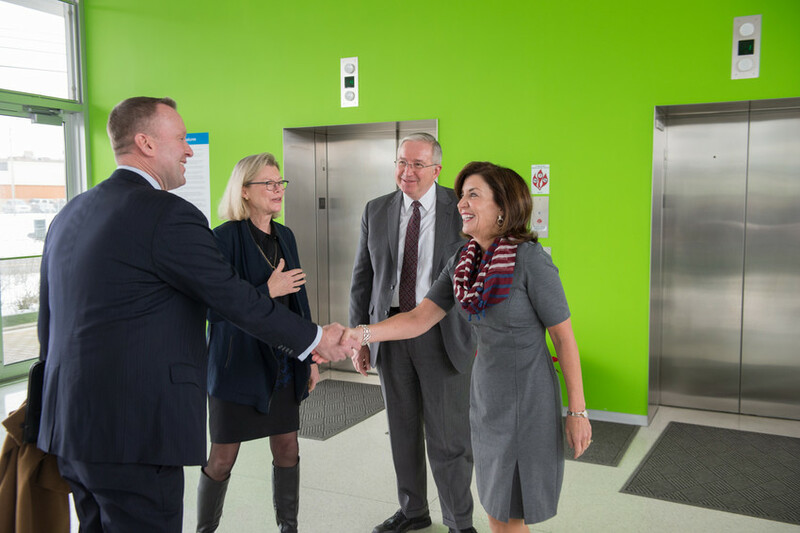 Hochul was joined by SyracuseCoE Executive Director Ed Bogucz for a tour and discussion of the research initiatives going on within both the Intelligent Control of Urban and Built Environments (ICUBE) and Willis H. Carrier Total Indoor Environmental Quality (TIEQ) Lab. 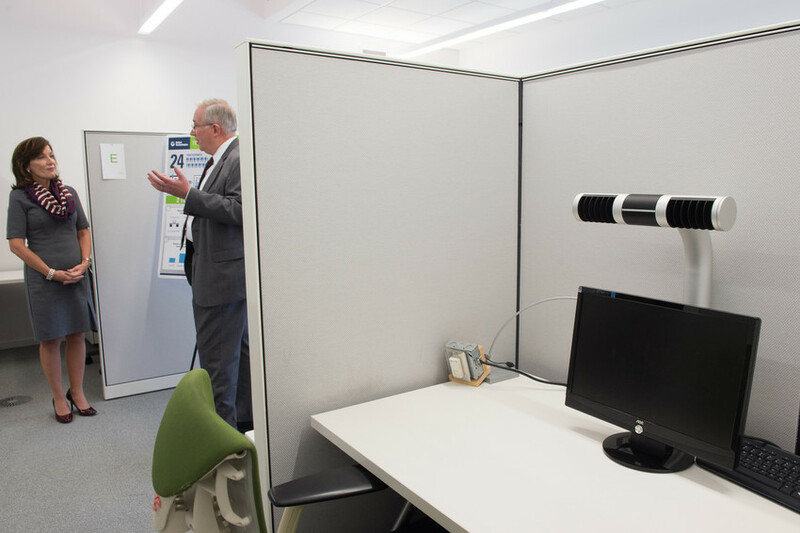 Researchers from Syracuse University, Upstate Medical, and SUNY ESF use the labs to determine how different indoor environmental factors influence human productivity and efficiency. 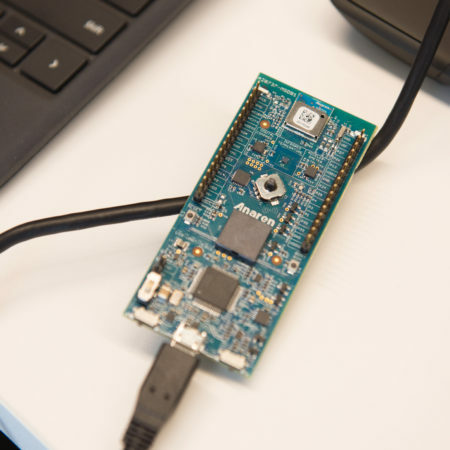 The TIEQ Lab allows researchers to control environmental factors such as humidity, lighting, temperature, and sound in order to study and document how to improve internal environmental quality and energy efficiency. The factors are tested and documented within the ICUBE test bed, which is designed to simulate a wide variety of common settings in commercial office buildings, including cubicles, offices and meeting rooms. 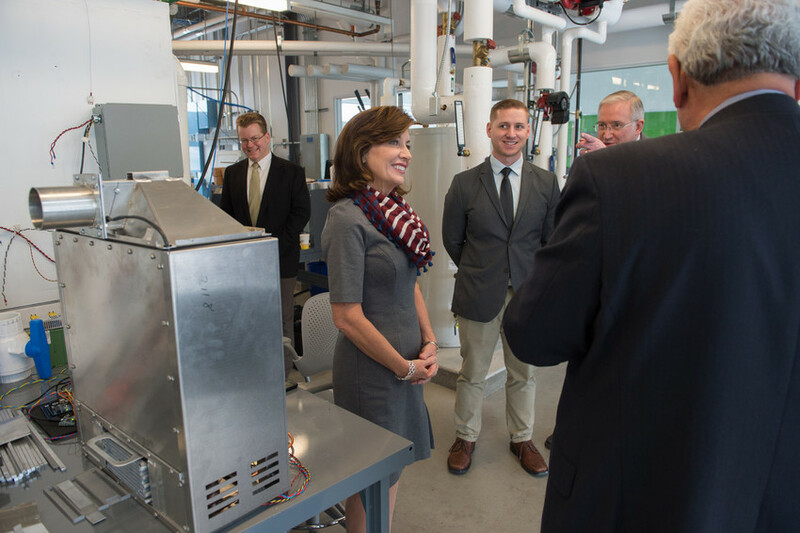 Hochul was interested in how these research projects and facilities promote entrepreneurship and ultimately boost the economy in Central New York. 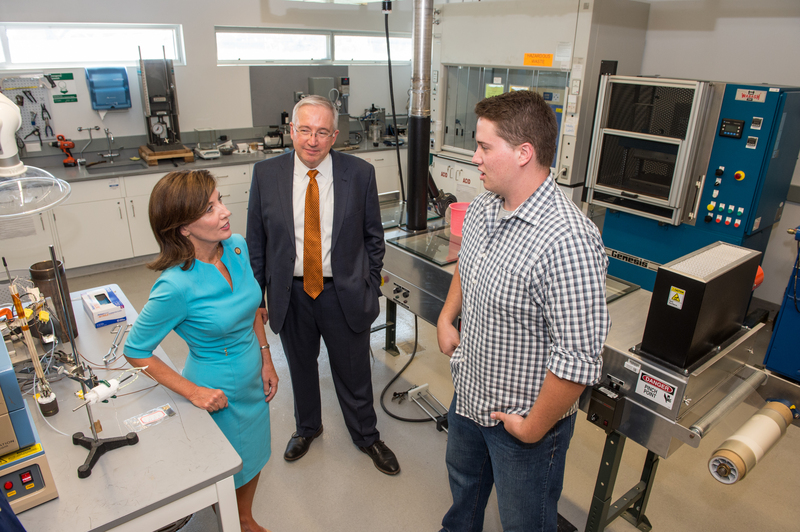 The support of student researchers and entrepreneurs prepares them for jobs at companies within Central New York, and the facilities help to draw bright faculty members to Syracuse University and SUNY ESF. Expertise: Energy conversion and heat transfer; Maroo heads Syracuse University’s Multiscale Research and Engineering Lab. Research Problem: Reducing energy consumption and improving per formance of manufactured goods through development of nanomaterials that lead to faster heat transfer. Backstory: Maroo’s research hinges on fundamentally changing the boiling process. Experimenting with different nano/micro patterns on silicon and silicon-dioxide surfaces, Maroo and his team found they could increase the bubbles forming on the sur face of boiling water, increasing heat transfer compared to smooth heating sur faces. With funding from SyracuseCoE’s AM-TEC initiative, the team was able to define the critical height of the surface pattern to optimize heat transfer, increasing heat transfer by 120 percent. SyracuseCoE Connection: Maroo received $100,000 from SyracuseCoE in 2013 under an award from the U.S. Department of Energy in support of a regional initiative to strengthen Central New York’s cluster of Advanced Manufacturers for Thermal and Environmental Controls (AM-TEC). “That funding allowed us to demonstrate our experimental capabilities, leading to additional support for new research,” says Maroo. Lab Report: Maroo is studying how the sur face pattern developed under the AM-TEC award can be used within boiler systems to improve heating and save energy costs. Another area of research focuses on cooling of electronics. Maroo received an NSF CAREER Award in 2015 to investigate the fundamental physics associated with nanoscale meniscus evaporation and passive liquid flow to remove large amounts of heat from surfaces in very short amounts of time. Eventually, this knowledge could be applied to achieve next-generation heat exchangers for thermal management of electronics and renewable energy technologies such as concentrated solar photovoltaic cells. Aha Moment: Studying the boiling process, Maroo’s research group has created a single vapor bubble in a pool of liquid that can remain stable on a sur face for hours, instead of milliseconds. “This will help us understand and predict the boiling process further so we can design structures and sur faces accordingly,” he says. 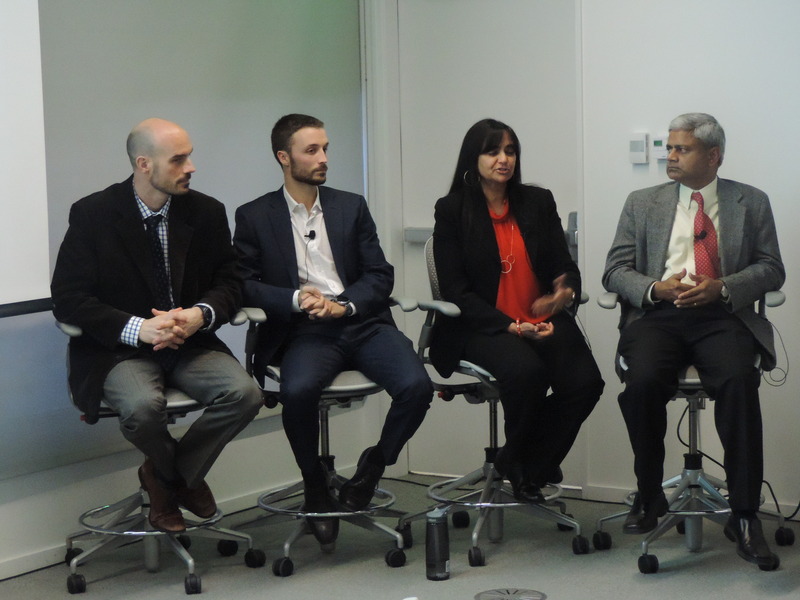 SyracuseCoE celebrated Global Entrepreneurship Week with a Research & Technology Forum that featured three perspectives on commercializing innovations energy and environmental systems. 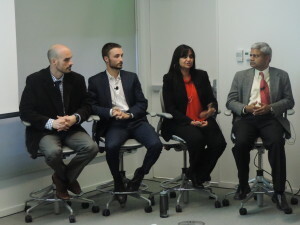 Those who presented were a founder and CEO of a student-led venture, a faculty entrepreneur who participated in the National Science Foundation’s I-Corps program, and a founder of a start-up company that brought game-changing LED lighting to sporting arenas across the country, including a stadium that hosted the Super Bowl. The presenters offered personal insights on opportunities and challenges along the paths of entrepreneurship and innovation. Joe is uncompromisingly committed to creating a whole new evolution in LED lighting technology. He drives design and engineering solutions to deliver what the customer needs rather than what the industry has been making. Joe brings to Ephesus 30+ years of experience and career achievements, which include work with industry leaders like Motorola, Fairchild Semiconductor, Lockheed Martin and part of the startup team for WaferTech, a Washington state-based semiconductor facility he helped grow to 1400+ employees and $1 billion in revenue. Luk is a faculty member in the Chemistry Department of Syracuse University since 2004. With a few of technologies spun out of his laboratory, and with his scientific advisory experiences to two biotechnology companies, Luk founded LifeUnit LLC, a startup company that develops chemical innovations for controlling bacteria-related diseases and problems. LifeUnit LLC has won the Innovation Corps grant from National Science Foundation, and Luk is the acting Chief Scientific Officer for the technical operation of LifeUnit. Josh Aviv, the Founder and Chief Executive Officer of SparkCharge, holds a bachelors degree in Economics from Syracuse University with a focus in Environmental Economics and currently finishing his master’s degree in Information Science, with a C.A.S. in Data Science. Josh is in charge of product development and day-to-day operations including establishing relationships with electric vehicle (EV) owners. Josh, an EV owner himself, has extensive EV expertise and has been in the industry for the past 3 years. Research Problem: Develop alternative energy technologies that improve current thermal systems while reducing harmful emissions by furthering the understanding and application of fuel cells in the energy field. Lab t0 Market: Ahn and his research group are experimenting with flame-assisted fuel cells to convert chemical reaction with heat directly to electricity. The idea is to modify existing home furnace/boiler systems with flame-assisted fuel cells that could generate electricity while generating heat, allowing it to run off grid. “If you lose power, your furnace/boiler could still be operated to supply heat and hot water and also generate enough electricity to run your lights and your refrigerator,” Ahn says. When the power is on, the flame-assisted fuel cell technology can offset residential electrical loads up to 20 percent during peak hours of operation, reducing demand on the grid and the electric bill. “Flame-assisted fuel cell technology has the potential to provide a resilient and efficient solution for residents during power interruptions,” says Ahn, who has received interest from potential commercial partners. He has six patents issued or pending related to fuel-cell technology. SyracuseCoE Connection: Ahn runs Syracuse University’s Combustion and Energy Research (COMER) Lab, which is located at SyracuseCoE. The new 1,500-square-foot lab was designed by Ahn and is equipped with state-of the-art instrumentation specifically to fabricate fuel cells, batteries, and other electrochemical devices and to characterize and test them with thermo chemical systems. In 2013, Ahn received funding from SyracuseCoE’s AM-TEC initiative, allowing him to demonstrate proof-of concept of the flame-assisted fuel cell and to publish several papers. Subsequently, he has received SyracuseCoE assistance with additional funding proposals; most recently, he won a competitive award from NYSERDA to advance the project. SyracuseCoE announced today that six research and innovations projects led by faculty members from Syracuse University and SUNY College of Environmental Science and Forestry (ESF) were competitively selected to receive awards totaling $114,000. The projects engage a total of 12 faculty members from four schools and colleges at Syracuse University and SUNY ESF. The awards expand the Faculty Fellows program that SyracuseCoE launched in the 2015-2016 academic year. Each faculty member who is involved in a project will be appointed as a SyracuseCoE Faculty Fellow for a three-year term, joining the ranks of 22 SyracuseCoE Faculty Fellows who were appointed last year. Projects were selected based on proposals received through a request for proposals issued by SyracuseCoE earlier this year. 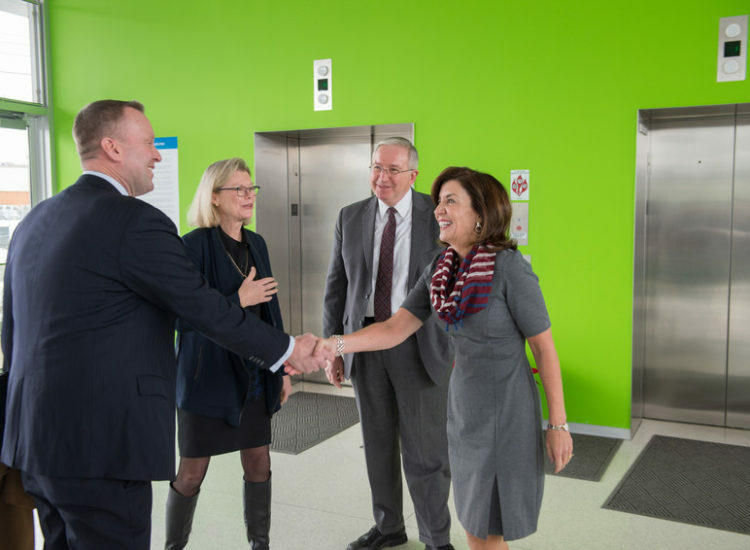 SyracuseCoE is New York State’s Center of Excellence in Environmental and Energy Systems, which is led by Syracuse University in collaboration with SUNY ESF, SUNY Upstate Medical University, CenterState Corporation for Economic Opportunity and dozens of partner firms. More information on each project can be found on SyracuseCoE Researchers Page. The awards were made possible by funding to support SyracuseCoE actitivites awarded by Empire State Development’s Division of Science, Technology and Innovation (NYSTAR). The next request for proposals for the SyracuseCoE Faculty Fellows Program is planned for in April 2017 for projects beginning in July 2017. Charles Driscoll and Kathy Fallon Lambert presebted the results of an ongoing project on co-benefits associated with policies to control carbon dioxide emissions from electric utilities by a boundary-spanning organization, the Science Policy Exchange. Carbon dioxide emissions standards for U.S. power plants will influence the fuels and technologies used to generate electricity, altering emissions of pollutants and affecting ambient air quality and public and ecosystem health. Three alternative scenarios for U.S. power plant carbon standards were evaluated for changes in fine particulate matter (PM2.5) and ozone concentrations in ambient air, and resulting public health and ecosystem co-benefits For two of the three policy scenarios, carbon standards for existing power plants can substantially decrease emissions of co-pollutants, and improve air quality and public health beyond existing air quality policies. A stringent but flexible policy that counts demand-side energy efficiency toward compliance yields the greatest health and ecosystem benefits, and a favorable benefit-cost analysis. The magnitude and the nature of the co-benefits associated with this policy were highly distributed spatially with all of the coterminous states receiving some health benefits and many states experiencing ecosystem benefits. Their work involves an evaluation of options considered for implementation of the U.S. Environmental Protection Agency Clean Power Plan. In addition to the presentation on co-benefits, there was a discussion of the Science Policy Exchange and the outreach effort associated with the project. Charles T. Driscoll is a Distinguished and University Professor at Syracuse University. He received his BS from the University of Maine and MS and PhD from Cornell. Driscoll’s research addresses the effects of disturbance on forest, freshwater and marine ecosystems, including air pollution (acid and mercury deposition), land-use, and climate change. Driscoll has testified at Congressional and state legislative committee hearings, and served on many local, national and international committees. He is a member of the National Academy of Engineering. 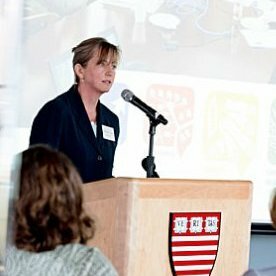 Kathy Fallon Lambert directs the Science Policy Exchange and the Science & Policy Integration Project at the Harvard Forest, Harvard University. The Science Policy Exchange is a consortium of six universities and research institution (including Syracuse University) working at the science-policy interface to enhance the influence of science on environmental decision-making. Previously, Kathy was the executive director of the Hubbard Brook Research Foundation (HBRF) where she helped develop the Science Links program to bridge the gap between long-term biogeochemical research and related public policy. Kathy has collaborated with Dr. Charles Driscoll, Syracuse University Professor of Environmental Systems Engineering, on three high-impact projects that link science with policy: Acid Rain Revisited, Mercury Matters, and Co-Benefits of Powerplant Carbon Standards. Kathy holds a B.A. from Dartmouth College and an M.F.S. from the Yale School of Forestry and Environmental Studies. She is a Switzer Fellow, Leopold Schepp Scholar and recipient of the U.S. EPA Environmental Merit Award. Expertise: Aerodynamics and propulsion, energy conversion and heat transfer, and fluid mechanics. Research Problem: Enabling the design of advanced combustion systems through models of renewable and clean fuels to contribute to a more sustainable energy economy. Akih-Kumgeh uses experiments and computations to study the physical and chemical processes that occur during energy conversion with a special focus on the combustion behavior of alternative fuels. SyracuseCoE Connection: Akih-Kumgeh directs Syracuse University’s Thermodynamics and Combustion Lab, located in the lab wing at SyracuseCoE. He designed the lab, which has been operational since December 2014, specifically to accommodate the 10-meter shock tube used in combustion experiments, as well as equipment to investigate flame propagation. SyracuseCoE provided funding that enabled him to purchase a laser used to quantify pollutant formation during combustion events. “Combustion research is not only concerned with engines but also with its effects on the environment. Our location at SyracuseCoE is of great benefit to my students; they can put their research in the broader context of energy and environmental systems,” Akih-Kumgeh says. The shock tube allows Akih-Kumgeh and his students to create very clean conditions of high temperature and pressure to characterize the ignition behavior of promising fuels. Engines operate at various conditions and the research focuses on how these conditions affect ignition. Physical experiments are used to test and improve mathematical models that can predict ignition behavior under a wide number of conditions, eliminating the need to build expensive experiments to test ever y condition. “Computational analysis of complex processes like combustion allows you to reduce the amount of time needed to develop or modify a cleaner and more efficient engine,” Akih-Kumgeh says. Akih-Kumgeh’s team is also studying the chemical compounds formed during the combustion process—such as carbon monoxide—including how much remains once the combustion process has finished. “We can quantify and compare the emissions of different fuels with the idea of reducing the emission of carbon monoxide into the environment,” he says. Akih-Kumgeh says the same combustion principles that apply to automobiles, jet engines, and rockets can be applied to boilers and residential furnaces that use natural gas. “If you want to increase the use of biofuels inside these systems, then you need to know how the combustion behavior would change and make sure the emissions from that particular modification are within the required limits,” he says. Students from Syracuse University, SUNY College of Environmental Science and Forestry (ESF), Clarkson University, and Rochester Institute of Technology presented posters. Students’ presentations were evaluated on the information presented about their projects, the layout and design of their posters, and their knowledge and ability to answer questions from the judges. Judges met with each student for 5-10 minutes to discuss their projects. 1st Place: Bryan Morris, Mechanical Engineering major, Syracuse University, “Design and Testing of a Micro Scroll Compressor”; Faculty advisor: H. Ezzat Khalifa. 2nd Place: Olivia Chen, Chemical Engineering major, Syracuse University, “UV Method for Total Mercury Analysis”; Faculty advisor: Charles Driscoll. 1st Place: Matthew Rushby, M.S. Mechanical and Aerospace Engineering major, Syracuse University, “Exploring the Performance of Dual-Phase Oxygen Transport Membranes for Carbon Capture Purposes”; Faculty advisor: Jeongmin Ahn. 2nd Place: Leah Harnish, M.S. Environmental Studies major, SUNY ESF, “Comparing Water Source Knowledge in Cities that exceed the Lead Action Level”; Faculty advisor: Sharon Moran. 3rd Place: Sebastien Simonnet & Christine Robillard, Master of Architecture I majors, “Light Breeze”; Faculty advisors: David Shanks and Bess Krietemeyer. 3rd Place: Kristina Gutchess & Shannon Garvin, Earth Sciences students, Syracuse University, “Increased salinity in central New York headwater catchments associated with long-term road salt application”; Faculty advisors: Laura Lautz, Zunli Lu, and Li Jin (SUNY-Cortland). Poster judges included Yahya Al Rayyes, HealthWay Home Products; Vincent Bongio, SBB, Inc.; Joseph Borowiec, NYSERDA; Aimee Clinckhammer, NYS DEC; Robert DelZoppo, SRC, Inc.; Hugh Henderson, CDH Energy; Peter King, King + King Architects; and Lawrence Wetzel, Air Innovations. Click here to view a pdf of all of the student abstracts submitted for the 2016 SyracuseCoE Symposium Student Poster Competition. SyracuseCoE—New York State’s Center of Excellence in Environmental and Energy Systems—recently launched a new round of its Faculty Fellows Program. 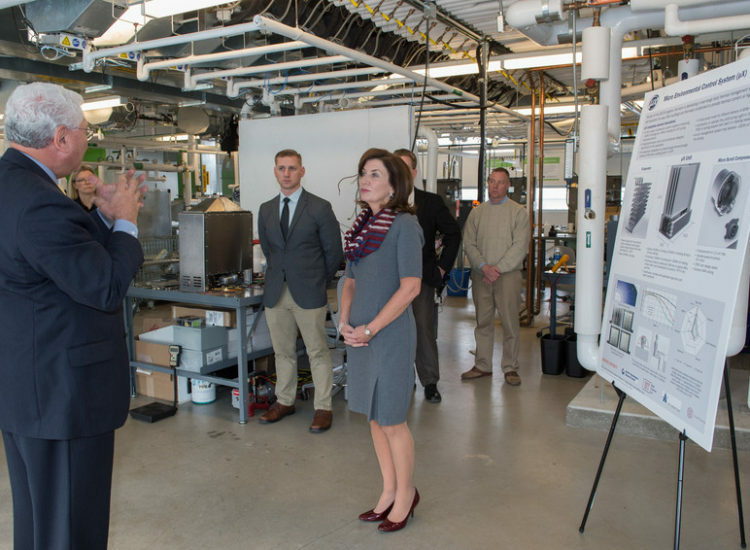 The intent of the program is to strengthen faculty scholarship in SyracuseCoE’s core technical areas: clean and renewable energy, indoor environmental quality, and water resources. The Faculty Fellows Program will fund projects to provide research leadership to SyracuseCoE and support engagements with academic and industry partners. For the 2016-2017 Academic Year, SyracuseCoE is opening the Faculty Fellows Program to all faculty at SyracuseCoE Partner institutions Syracuse University, SUNY Upstate Medical University (UMU), and SUNY College of Environmental Science and Forestry (SUNY-ESF). SyracuseCoE has released a Request For Proposals and intends to award up to $100,000 in this round. The deadline for applications is October 2, 2016. 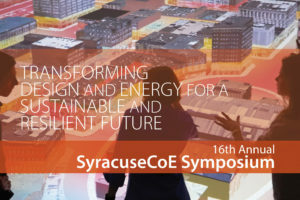 SyracuseCoE will host its 16th annual Symposium next week, featuring advances in research and technology that are transforming design and energy for sustainable and resilient built environments. The Symposium will be held on September 21 and 22 at the Crowne Plaza on 701 E. Genesee St. and at SyracuseCoE Headquarters, 727 E. Washington St., in Syracuse, NY. The one-and-a-half day Symposium will bring together experts on high-performance buildings, the electrical system and smart grids, and opportunities for future innovations impacting the built environment. This year’s program will feature five keynote speakers and more than 40 speakers in sessions that address topics from high-performance buildings to human-centered urban design, from nanoscale-enabled energy systems to cyber-physical interactive environments, and from smart grids and power system resiliency to adaptive building systems and performance augmentation materials.The event also includes a poster session and competition featuring 31 students from four universities, a dynamic networking reception, and tours of new SyracuseCoE Laboratories. 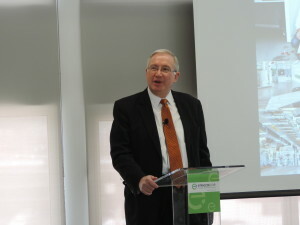 “The SyracuseCoE Symposium offers our stakeholders in academia, industry and government an opportunity to come together with others in the community to share cutting edge research and develop new collaborations to address key challenges and opportunities for clean energy innovations for a vibrant future.” said Ed Bogucz, executive director of SyracuseCoE. Review the Symposium Program Schedule here. Registration is required and seating is limited – please visit the SyracuseCoE Symposium Registration page for more information and to register. Expertise: Emerging material technologies, human interaction, and computational simulations influencing the design of sustainable built environments. Backstory: As a doctoral student at Rensselaer Polytechnic Institute, Krietemeyer was part of a team that developed an innovative facade system installed at the SyracuseCoE headquarters as a demonstration project. After she joined the faculty of the Syracuse University School of Architecture, she turned to SyracuseCoE as a natural partner for assistance with developing her own research projects. Lab Report: With funding provided by SyracuseCoE, Krietemeyer is developing a computational tool that combines traditional energy analysis with virtual reality tools. The project includes collaboration with fellow Syracuse University School of Architecture Professor Amber Bartosh, Syracuse University College of Engineering and Computer Science Professor Jianshun Zhang, and visual artist Lorne Covington. “We’re conducting energy analysis and translating that information into dynamic, spatial, 3-D visualizations so we can virtually experience energy flows within a building in an interactive way,” Krietemeyer says. Single-pane windows are a legacy of an earlier era of building construction. Despite their inefficiency compared to modern panes, they are still fairly common even in a cool climate such as Syracuse’s. There’s enough energy to be saved by improving them that ARPA-E, one of the newest agencies in the U.S. Department of Energy, has just launched the “SHIELD” program of fourteen research projects. This talk introduced the intricate science underlying the performance of the apparently simple single pane window. Dr. Blanchet then described the very challenging materials developments that are needed to improve them. The same developments in science may also lead to new technologies for windows in new construction. Finally, Dr. Blanchet provided a narration for the development of SHIELD as an example of how ARPA-E funds energy research, and summarized the portfolio of windows research projects that have been funded by ARPA-E.
Dr. Graciela Blanchet helps prepare breakthrough energy technologies for transition from lab to market, specifically focusing on renewable energy and carbon footprint mitigation. Prior to joining ARPA-E, Blanchet served as the Chief Technical Officer at NanoTerra for five years. While in this role, Blanchet recruited and hired top-tier scientists and guided them in the process of development and commercialization of functional nanomaterials, water purification reactors, and high resolution printing of silicon-photovoltaic cells. Prior to working at NanoTerra, Blanchet spent much of her career at DuPont where she held multiple positions. While at DuPont, Blanchet led the printable electronics and laser imaging efforts developing technologies that have since been successfully commercialized. Blanchet holds her Ph.D. in Physics from Brown University and a B.S. in Physics from the University of Buenos Aires. Blanchet has more than 60 patents and has published more than 65 academic papers. 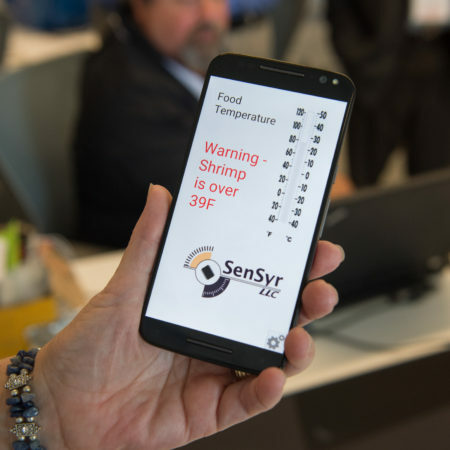 Mission: Design and develop IoT-enabled capabilities for products in Central New York’s thermal and environmental controls cluster. 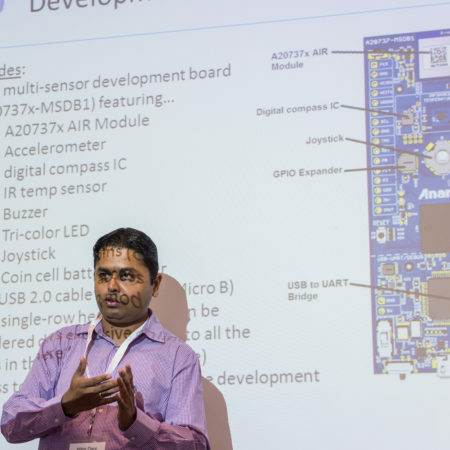 Outcome: Students and industry professionals competed in teams to conceive, develop and demonstrate actual working product concepts for IoT-enabled embedded devices utilizing Anaren’s Atmosphere IoT Development Platform, a web-based development platform that enables IoT capabilities in systems using Bluetooth® Low Energy devices. Special thanks to Anaren for their guidance and leadership throughout the hackathon. Participants listening to Mihir Dani as he guides them through the TEChack’s process. 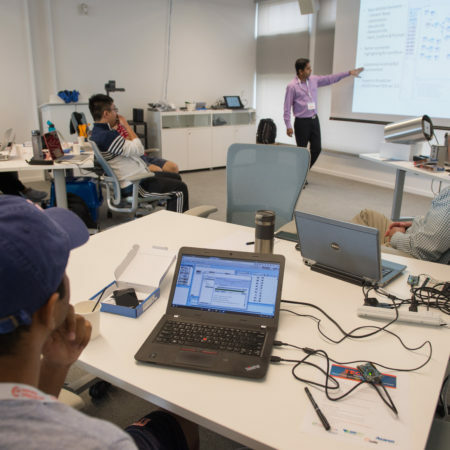 During TEChack, teams were guided by Mihir Dani of Anaren, a Syracuse University College of Engineering and Computer Science graduate and a recognized award-winning “hackspert” who has mentored numerous teams who went on to become hackathon winners at IoT World 2015, 2016 and Sensors Expo 2016. Participant working on his team’s product during the overnight TEChack. “TEChack exemplifies opportunities for firms in Central New York to incorporate ‘data-to-decision’ technologies into their next-generation products,” said Cindy Oehmigen, president of the CNY Technology Development Organization. Participant demonstrating the functionality of his group’s project. 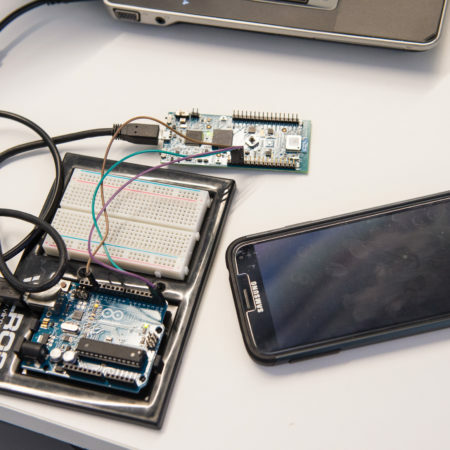 Participants developed actual working products during the TEChack. 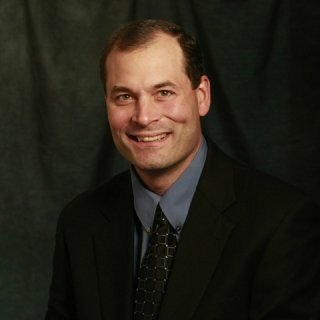 “The Internet of Things continues to create an amazing variety of new and innovative solutions for companies around the world, and we welcome this opportunity to help students and professionals in Central New York explore possibilities and perhaps set the stage for prototyping the next great IoT innovation,” says Mike Bowyer, Anaren’s Director of Business Development, Wireless IoT. Participant explaining his group’s idea and product. Expertise:Modeling urban energy flows and human-powered mobility; daylighting and energy in building technology applications; the use of unmanned drones for building performance inspections. Research Problem: Designing cities for pedestrian comfort. Rakha’s work on sustainable urban mobility looks at how weather conditions and the built environment influence walking and biking in urban communities. “It’s about planning for thermal and visual comfort under predictable conditions, such as cold winters and hot summers,” says Rakha. Backstory: Rakha’s doctoral dissertation from MIT focused on comfortable and walkable cities. He was also part of a research team that developed a citywide building energy model for Boston, which estimated the gas and electricity demand of every building in Boston. SyracuseCoE Connection: Rakha was attracted to Syracuse University, in part, because of the resources available through SyracuseCoE. “I was excited about the kind of support I could get here that I couldn’t get anywhere else,” says Rakha. That includes networking, access to industr y partners, lab space to develop research activities, and assistance with grant proposals. Prior to the official start of his faculty position, SyracuseCoE helped Rakha submit a proposal in response to a solicitation from NYSERDA. The proposal was funded, supporting a study of sustainable transportation alternatives in Syracuse. 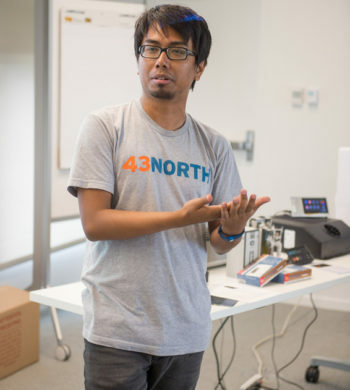 Subsequently, SyracuseCoE assisted Rakha develop a proposal to SageGlass for a study of daylighting and energy in buildings; he also is using space in the SyracuseCoE lab wing to test his drone with various sensors. Lab to Market: Rakha’s NYSERDA-funded study examines the walkability and bikeability of downtown Syracuse, including outdoor thermal comfort, as well as sharing economy technologies in the City of Syracuse (e.g., bike and car sharing), and public transit and regional relationships between Syracuse and Central New York. “SyracuseCoE has relationships with all the relevant stakeholders so whatever outcomes we present from our feasibility study will directly link to each of them,” says Rakha. 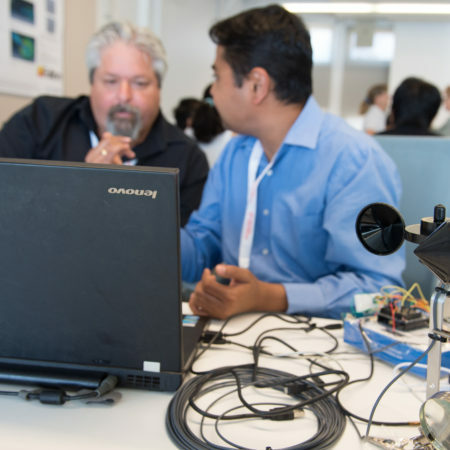 SYRACUSE, NY, July 25, 2016 – Targeting emerging opportunities for a new generation of innovative products in the Central New York’s industry cluster in thermal and environmental controls (TEC), SyracuseCoE invites students and professionals to participate in “TEChack, “a 2-day “hackathon” on August 1 and 2. SyracuseCoE organized TEChack in partnership with Anaren, Inc., the CNY Technology Development Organization, and CASE at Syracuse University. TEChack is designed to conceive TEC innovations that are capable of operating within the exponentially growing “Internet of Things (IoT).” – Students and industry professionals will compete in teams to conceive, develop and demonstrate actual working product concepts for IoT-enabled embedded devices utilizing Anaren’s Atmosphere IoT Development Platform, a web-based development platform that enables IoT capabilities in systems using Bluetooth® Low Energy devices. 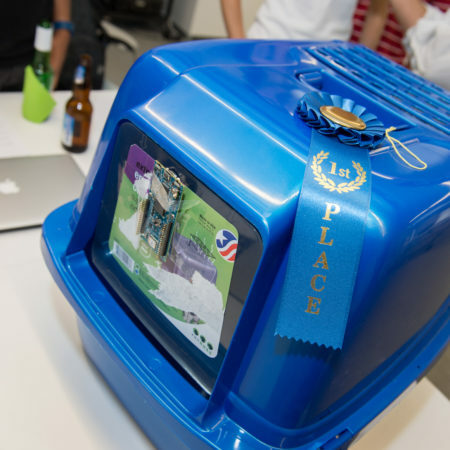 Winning teams will receive cash prizes, and each participant will receive an Anaren Multi-Sensor Development Kit and access to the free Anaren Atmosphere development platform. 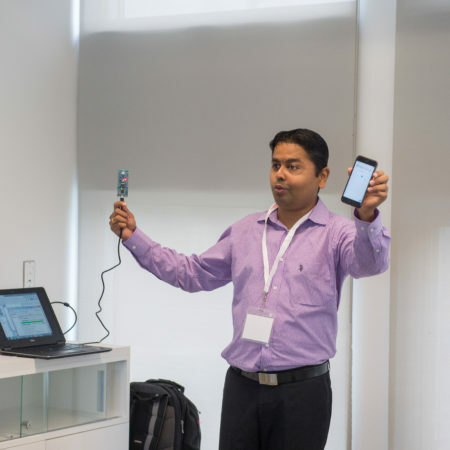 During TEChack, teams will be guided by Mihir Dani of Anaren, a Syracuse University College of Engineering and Computer Science graduate and a recognized award-winning “hackspert” who has mentored numerous teams who went on to become hackathon winners at IoT World 2015, 2016 and Sensors Expo 2016. 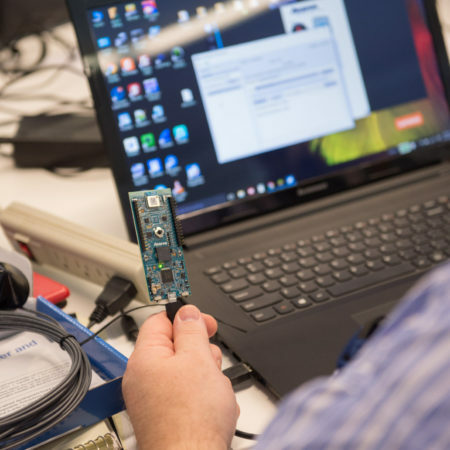 “Anaren is very pleased to partner with SyracuseCoE in developing TEChack,” said Mark Bowyer, Anaren’s Director of Business Development, Wireless IoT. 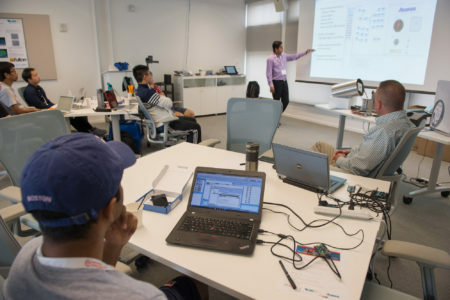 “The Internet of Things continues to create an amazing variety of new and innovative solutions for companies around the world, and we welcome this opportunity to help students and professionals in Central New York explore possibilities and perhaps set the stage for prototyping the next great IoT innovation,” Bowyer added. 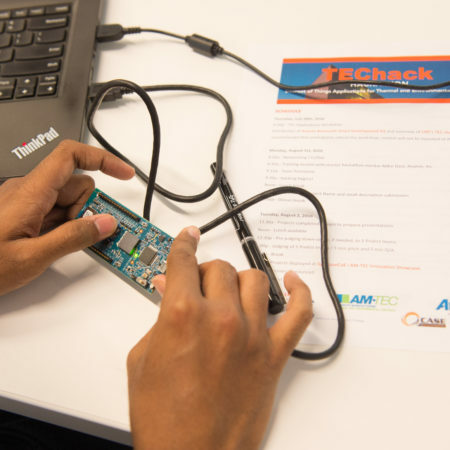 TEChack is supported by the Advanced Manufacturing in Thermal and Environmental Controls (AM-TEC) initiative, which is designed to strengthen the cluster of Central New York manufacturers of systems that heat and cool buildings, refrigerate produce, control manufacturing processes, and enable a variety of other applications. AM-TEC is led by SyracuseCoE in partnership with CenterState Corporation for Economic Opportunity, Manufacturers Association of Central New York, NYSTAR, Central New York Technology Development Organization, SUNY College of Environmental Science and Forestry, and Onondaga Community College Small Business Development Center. Additional information about TEChack is available at techack.eventbrite.com. 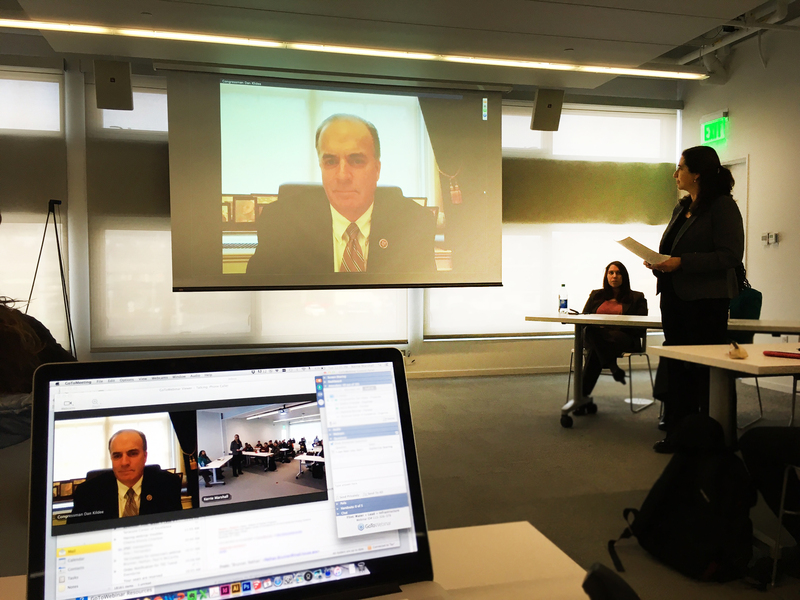 SyracuseCoE, New York State’s Center of Excellence in Environmental and Energy Systems at Syracuse University engages collaborators at 200+ companies and institutions to address global challenges in clean and renewable energy, indoor environmental quality, and water resources. Our members conduct targeted research, demonstrate new technologies, commercialize innovations, and educate the workforce. About to enter its 50th year in business, Anaren, Inc. designs, manufactures and sells custom high-frequency solutions and standard components for the wireless communications, space and defense electronics, wireless consumer electronics, and IoT markets. Additional information can be found at www.anaren.com. “one-size-fits-all” in terms of comfort—with this approach, at least 20 percent of occupants are typically dissatisfied with the temperature they experience. 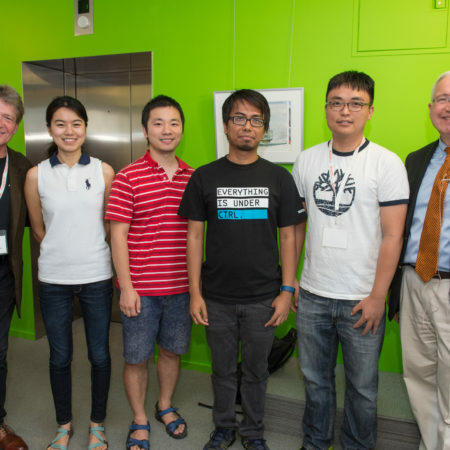 With support from SyracuseCoE, faculty and students at Syracuse University and their collaborators have been working for years to transform HVAC systems through the development of personalized environmental control systems (PECS), that would allow individual occupants to adjust heat and cooling to their own level of comfort. The PECS vision took a big leap for ward with the award of a $3.2 million grant from the U.S. Department of Energy’s Advanced Research Projects Agency-Energy (ARPA-E), and companion awards of $319,000 from NYSTAR, and $400,000 from NYSERDA. used for HVAC nationally, while simultaneously improving occupant comfort and indoor air quality. NYSTAR Distinguished Professor H. Ezzat Khalifa leads the Syracuse University team that is developing a near-range micro-environmental control system. The system will provide local cooling and heating via a box about the size of medium-tower computer that will fit under an individual’s desk. The unit has a high-efficiency micro-vapor compression system with a tiny scroll compressor and an evaporator embedded in a phase-change material. This material will store the cooling or heating produced by the micro-vapor compression system at night, releasing during the day to make occupants more comfortable. In addition to researchers at Syracuse University and SyracuseCoE, the three-year project includes partners United Technologies Research Center, Air Innovations, Bush Technical LLC, and Cornell University. The SU team was one of 11 funded nationally. This is the first ARPA-E grant awarded to Syracuse University. SyracuseCoE aided the project team in the development of the proposal and is a key player in the execution of the research, including bringing the technology to market. China’s rapid industrialization has come at a cost: The country is afflicted with some of the worst air pollution in the world. But one Central New York company is improving air qualityin China—and throughout Asia—one building at a time. HealthWay Products manufactures air cleaning and filtration products for homes, businesses, and medical environments. capturing 99.99 percent of air contaminants. HealthWay develops products that clean air at point of use by filtering contaminants generated within a space and at point of entry by cleaning air filtered into a building as part of its HVAC system. Customers include the Cleveland Clinic, Hyatt Hotels, Marriott, Harvard University, Starwood Hotels, Texas Instruments, BMW, Volkswagen, and Crystal Cruises. The company, named to the Inc. 5000 list of fastest growing privately held companies in North America, sells its products in 30 countries. Asia is the biggest growth market and SyracuseCoE has been an important partner in HealthWay’s expansion efforts. In 2013, HealthWay received a $50,000 Commercialization Assistance Program grant from SyracuseCoE to help commercialize and test a disinfecting filtration system specifically for the Asian market. The grant supported the assistance of Syracuse University Professor Jianshun Zhang, who conducted testing of the product. At the Building Energy and Environmental Systems (BEES) Laboratory in the College of Engineering and Computer Science at Syracuse University, Zhang simulated air pollution to evaluate the filter’s per formance in cleaning air “breathed in” by building HVAC systems in China. corporate headquarters in China, the Saudi Ministry of Health, and hotels throughout Asia. Lobdell says that product—the 2000 SC—is now the cornerstone of the company’s commercial line. In 2015, HealthWay purchased an additional facility in Pulaski to accommodate its manufacture, as well as to bring back other products the company was manufacturing in China, adding approximately 20 jobs to the Central New York region. Expertise: Measuring the impact of environmental conditions on cognitive function. Backstory: Satish has broad experience using the research tool Strategic Management Simulation (SMS) to study how wide-ranging variables impact cognitive function and real-world productivity, from drugs and alcohol to sleep deprivation to head injuries. In 2006, after completing a study on how various medications for seasonal allergies and rhinitis affect cognitive function, she was sought out by SyracuseCoE to see if her methods might be effective for a forthcoming study on the impact of volatile organic compounds (VOCs) in paint on indoor environments. Satish collaborated on the project, using SMS to evaluate the impact of VOCs on productivity and decision-making and expanded her area of research interest in the process. SyracuseCoE Connection: In 2007, SyracuseCoE awarded nearly $300,000 for a two-year project led by Satish in collaboration with researchers at the Lawrence Berkeley National Laboratories to study the implications of low levels of carbon dioxide on people’s decision making and perceptions of indoor air quality. In 2009, SyracuseCoE awarded nearly $300,000 for a two-year project led by Satish in collaboration with the Lighting Research Center at Rensselaer Polytechnic Institute to study the impacts of daylighting on human decision making and productivity. Satish was a co-investigator of the 2014 COGfx study, leading the cognitive testing and analysis component. “The SyracuseCoE is a wonderful organization for showcasing the research treasures we have in Upstate New York,” she says. Current Project: Satish is collaborating with Syracuse University engineering professor Jianshun Zhang and King + King Architects to evaluate whether building renovations at Pine Grove Middle School in East Syracuse, New York, impact student learning. Data from SMS taken before and after the renovation under controlled conditions will be used to assess the impact of the built environment on student performance. SyracuseCoE is home to the Willis H. Carrier Total Indoor Environmental Quality (TIEQ) Lab, a one-of-its-kind facility that enabled what climate expert Joe Romm calls “the seminal green building study of our time.” The recent groundbreaking study on “The Impact of Green Buildings on Cognitive Function” (COGfx) found participants’ cognitive function not only changed in response to the quality of their indoor environment, but also doubled in environments with enhanced green building ventilation. The COGfx study “explains the great mystery of why better ventilation increases productivity,” says Romm, who heralded the findings at the 2015 Greenbuild International Conference and Expo for providing hard data that demonstrates the health and productivity benefits of green buildings. Findings from the COGfx study showed that cognitive performance doubled in conditions that replicated green buildings with enhanced ventilation and in some functional areas—including strategy and information usage—nearly tripled. Just as important, quantitative analysis of that increased productivity found that air quality and cost are no longer a trade-off. According to the study, doubling the ventilation rate in typical office buildings can be reached at an estimated annual energy cost of between $14 and $40 per person, depending on location; this investment can result in improved productivity valued at, on average, $6,500 per person per year. The COGfx study was led by researchers from the T.H. 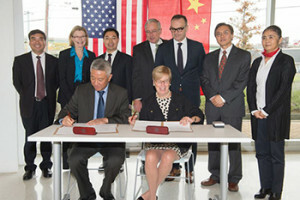 Chan School of Public Health at Har vard University, in collaboration with faculty members from Upstate Medical University and Syracuse University, and was supported by funding from United Technologies Corporation. Experiments were conducted at the TIEQ Lab in the fall of 2014 and results were published in a series of peer-reviewed papers beginning in fall 2015. 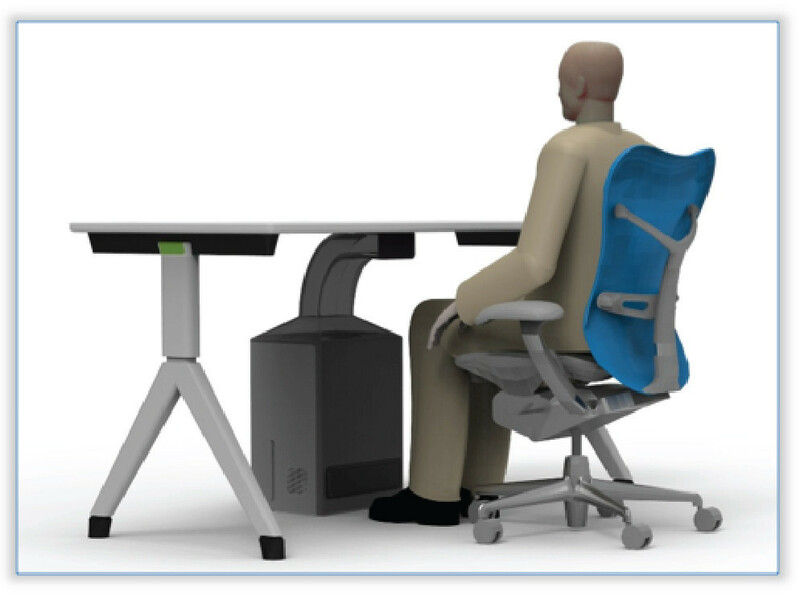 The COGfx study has important implications for the design and operation of environmental systems for office environments. “We spend 90 percent of our time indoors. It’s logical that this has an outsized impact on our overall health and well-being, as well as productivity,” says Joseph Allen, assistant professor and director of the Healthy Buildings Program at the Center for Health and the Global Environment at the Harvard Chan School. The TIEQ Lab consists of two rooms resembling a typical office environment; however, from the floor below, environmental conditions—such as ventilation rate, temperature, humidity, and carbon dioxide concentration— can be controlled with a high degree of precision. “This allowed us to make changes to the indoor environmental quality in the TIEQ Lab while keeping the participants blinded to test conditions,” says Allen. 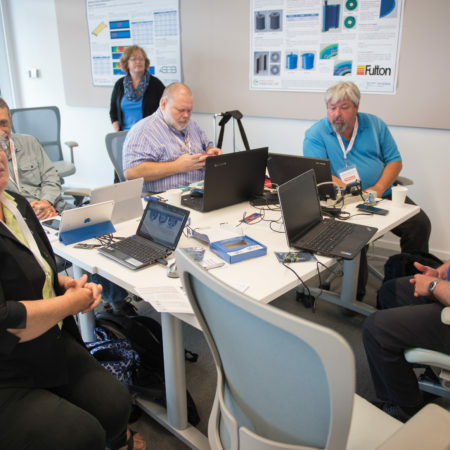 The COGfx study enlisted 24 professionals from Central New York firms and institutions to relocate to the TIEQ Lab for six days to per form their regular work. Near the end of each workday, they were given a cognitive assessment that evaluated real-world decision-making. Over the course of those six days, the indoor environment was modified to reflect conventional buildings, green buildings, and green buildings with enhanced ventilation. Not only were participants unaware of changes in environmental conditions, but researchers involved in the cognitive testing were also “blind” to changing conditions as well. “The double-blind nature of the study strengthens the integrity of our results,” says co-investigator Suresh Santanam, a Syracuse University Professor of engineering and computer science who is an expert in indoor air quality and air pollution control, and director of SU’s Industrial Assessment Center. Usha Satish, professor of psychiatry and behavioral sciences at Upstate Medical University, led the testing using the Strategic Management Simulation, a highly reliable cognitive testing tool. The computer-based test posed diverse situations based on real-world challenges, allowing users to respond and strategize in their own cognitive style. “The simulation scenarios have been validated to replicate people’s daily decision-making,” says Satish. This study—and the impact its results are expected to bring— is precisely what was anticipated when the lab was conceived. “Research is a long and costly process,” says Santanam. “It would not have been unusual if it took a decade for published research to have come out of the TIEQ Lab. Steam heating systems are widely used in New York State, in all kinds of buildings: universities, large high-rises, schools, and even homes. We know that converting steam to hot water systems routinely saves 50% of the heating energy use, as well as saving water. But it is not known how much steam heat in fact exists in the state – it is just not something that is inventoried in any of the various building information databases. So we set out to estimate how much steam is used in different kinds of buildings, and were surprised with the results. 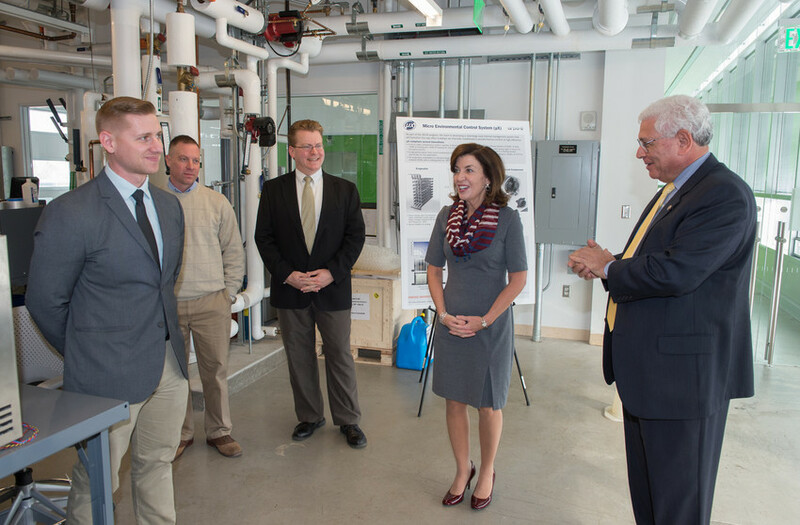 We also evaluated the savings to convert from steam to a new type of heating technology, variable-refrigerant flow heat pumps. Join us to learn how much steam we are blowing off, and how much we could save by converting steam to VRF heat pumps, in a fast-moving and information-filled session. Funding for this project was provided by the SyracuseCoE Partner Program Innovation Fund. Ian started Taitem Engineering in 1989. He has led several applied energy conservation research projects, has led many design and energy projects, and has delivered workshops in the area of energy and ventilation. He has also led the development of several computer programs which are used in the HVAC, energy, and indoor air quality fields, including TREAT (Targeted Residential Energy Analysis Tools), which was awarded the 2005 national R&D100 Award. He also developed an innovative desiccant cooling system, for which he holds a U.S. patent. Prior to starting Taitem Engineering, he worked for seven years at Carrier Corporation in Syracuse, where he designed heat pumps and air conditioning equipment, and holds eight patents from this work. He is the co-author of the book Green Building Illustrated (John Wiley and Sons), and is the author of the forthcoming book Energy Audits and Improvements for Commercial Buildings (John Wiley and Sons, April 2016). He holds an undergraduate degree from McGill University, and an M.S. from Columbia University, both in mechanical engineering. Ian is a licensed engineer in the states of New York, Pennsylvania, and Connecticut. In addition to increasing the technical skills of area students pursuing degrees in science, engineering, and architecture, program goals include increased post-graduation student retention in the Central Upstate region and the establishment of valuable relationships between college students and local firms. To date, more than 30 companies and 90 students have participated in this program, which will provide up to $3,000 toward an intern’s wages. The deadline to apply is March 31st. For 30 years, researchers at SyracuseCoE academic Partner SUNY College of Environmental Science and Forestry (ESF) have studied new forms of renewable energy. In the Department of Paper and Bioprocess Engineering, researchers use sugars derived from willow biomass to create biofuels with very low greenhouse gas emissions that will replace their fossil fuel counterparts. 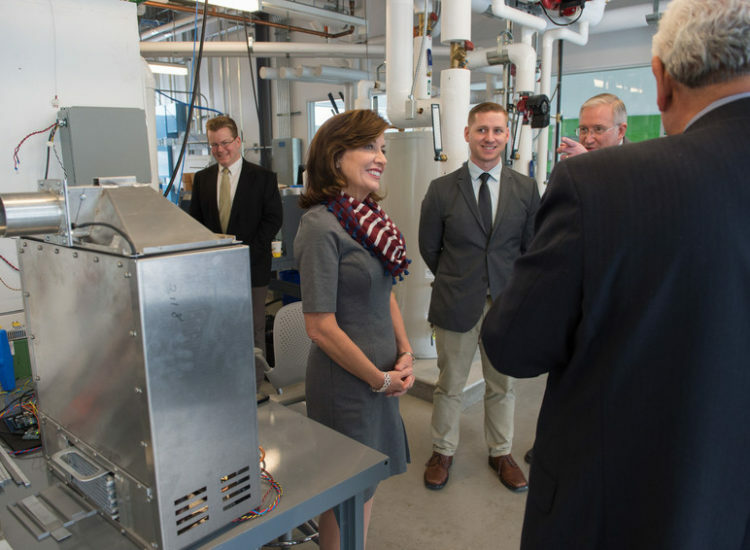 That research moved from the lab bench to production scale with the opening of the SUNY-ESF Biofuels Pilot Plant at SyracuseCoE in 2015. “We want to make the same portfolio of products you can make from fossil fuels,” says Art Stipanovic, ESF professor of chemistr y and director of the Pilot Plant. The new facility is a small-scale, commercial grade pilot plant that allows researchers to scale up the size of their production significantly, so that they can develop and demonstrate processes that will evolve into full-scale commercial production. The Pilot Plant includes a 1000-Liter fermenter that creates an optimal environment for microorganisms to convert wood-based sugars to fuels such as ethanol and butanol, and a 30-gallon-per-hour distillation column to distill the biofuels produced in the fermenter to high purity fuels suitable for testing in engines. 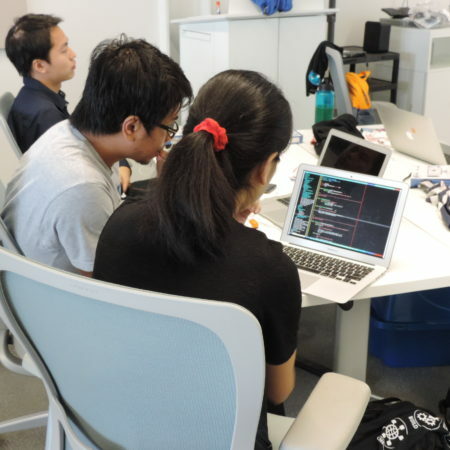 The facility provides a more robust learning and research environment in a real-world setting. “The goal is to move science into a technology and then into a commercial business,” says Amidon. It was during an internship at a paper mill while an ESF doctoral student that Bhayani had his aha moment. “There was a tremendous amount of paper waste that was already beaten and pulped,” he says. Bhayani saw this cellulosic waste as a readymade option for producing the sugars needed for fermentation to biofuels. 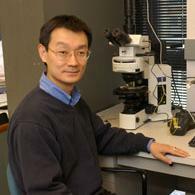 He and Ramarao, his doctoral advisor, received NYSERDA funding to develop and demonstrate the concept on a lab scale. 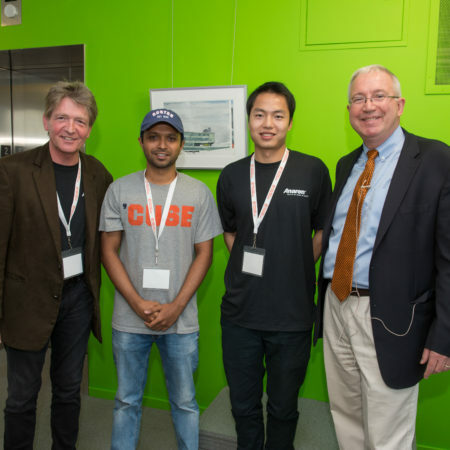 Bhayani also won $10,000 from SyracuseCoE in Syracuse University’s RvD IDEA student competition in 2013;the award served as a catalyst to start Avatar Sustainable Technologies to commercialize its proprietary technology for producing fermentable sugars for bioproducts industries. “Different biofuels and bio-plastics require different qualities of sugar. We’re working with people in academia, at the paper mills, and biofuels companies to make sure our processes are in alignment with their requirements,” he says. 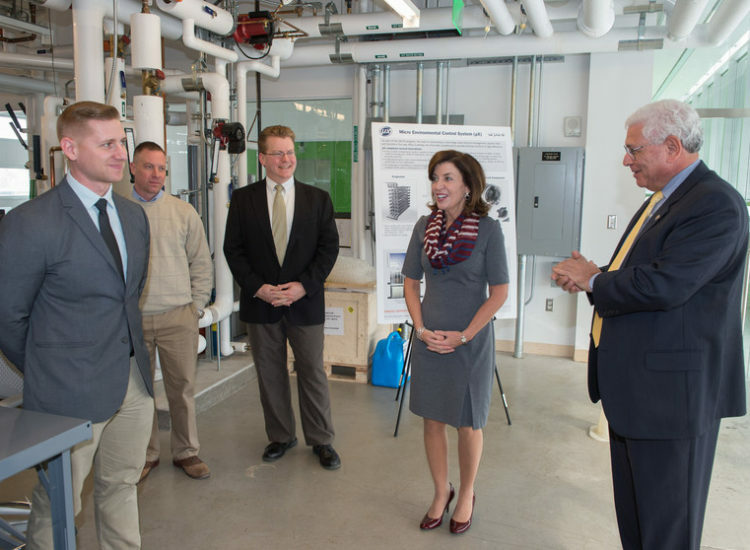 In addition to continued use of the ESF Pilot Plant, SyracuseCoE provides the firm with office space, funding through a $25,000 Innovation Fund award, and guidance in commercialization. “It would be very difficult to do this without the support of SyracuseCoE,” Bhayani says. In a lab on the third floor at SyracuseCoE headquarters, a group of Syracuse University graduate students works on a prototype for a heat exchanger that transfers heat with a low-pressure draw. Later that afternoon, another team will work on a structural analysis of a low-vibration cryo frigeration system in an attempt to find ways to reduce the vibration level even further. 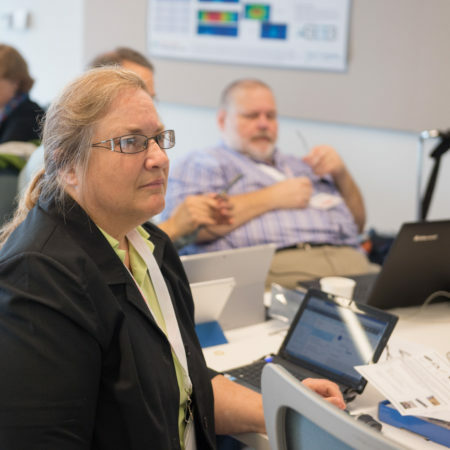 They’re working in the Analysis and Design Center, a NYSERDA funded resource created to assist firms in Central New York’s thermal and environmental control cluster accelerate development of innovative products. Under the super vision of faculty members from Syracuse University’s College of Engineering and Computer Science, these students are helping solve real-world problems for AM-TEC companies such as Cryomech, a world leader in cryorefrigeration and helium recovery systems. That’s where the Analysis and Design Center comes in. The center provides AM-TEC companies with assistance from a team of specially trained students from Syracuse University’s College of Engineering and Computer Science, who work under the super vision of faculty members. The students per form analysis and design using software for computational fluid dynamics or finite-element analysis. In addition to helping AM-TEC manufacturers develop new products, the Analysis and Design Center also benefits the students who are engaged. 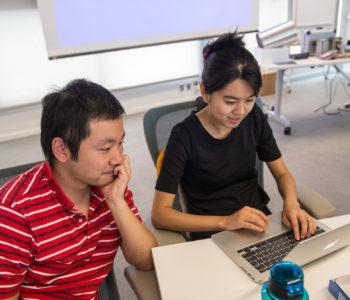 “By getting to work on problems not ‘well-posed’ in classroom homework or an exam, students have to make their own assumptions to solve the problem,” says Thong Dang, professor of mechanical and aerospace engineering at Syracuse University. In a six-day study in SyracuseCoE’s Total Indoor Environmental Quality Lab twenty-four professional employees – architects, designers, programmers, engineers, creative marketing professionals and managers – participated in a study examining the impact of green buildings on cognitive performance and decision-making performance. This week, researchers returned to SyracuseCoE to present the findings of this pioneering study to an audience of more than 140 total, including 70 via web and more than 70 in the room. “The Impact of Green Buildings on Cognitive Function” study found that participants’ cognitive performance scores averaged 101 percent higher in green building environments with enhanced ventilation compared to a conventional building environment. Researchers measured cognitive function for nine functional domains, including basic, applied and focused activity levels; task orientation; crisis response; information seeking; information usage; breadth of approach; and strategy. The largest improvements in cognitive function test scores was found in the areas of crisis response, information usage and strategy. Introduction by: John Mandyck, Chief Sustainability Officer, United Technologies Corporation. Because the study reflects conditions in indoor environments that many people encounter daily, these findings have far ranging implications for worker productivity, student learning, and safety. Green building design that optimizes employee productivity and energy usage will require adopting energy efficient systems and informed operating practices to maximize the benefit to human health while minimizing energy consumption. For more information about the Total Indoor Environmental Quality Lab, contact tlrosani@syr.edu. A shift to LED lighting is saving sports teams millions of dollars and improving fan experiences, in large part using products developed and manufactured by Central New York’s Ephesus Lighting. Since 2013, Ephesus lighting has been installed at more than 100 sports venues across the United States and Canada, saving an estimated 45-million kilowatts of energy and eliminating 34,000 tons of CO2 from being emitted into the atmosphere. Ephesus developed an ultra-high per formance LED technology with a patented lens design that is 75 percent more energy-efficient than the metal halide lights traditionally used at stadiums, providing fuller illumination and casting fewer shadows. And at much less cost—the average arena installation reduces energy costs by up to 85 percent, bringing a return on investment in less than five years. Since entering the sports LED market, Ephesus’ revenue has grown an average of more than 300 percent in each of the last three years. “We wouldn’t be where we are today without SyracuseCoE,” says Joe Casper, who founded the company in 2010 with his wife, Amy. The Caspers had worked for advanced technology companies across the United States, including Lockheed Martin in Syracuse and Motorola. 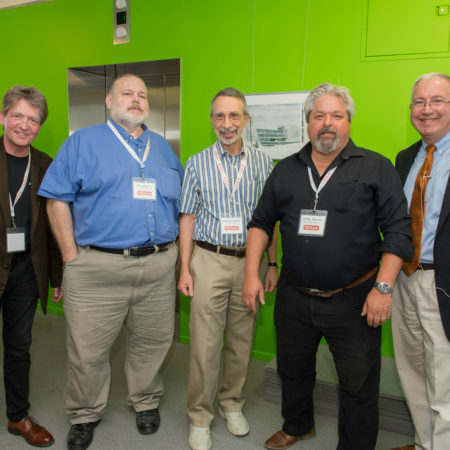 They returned to Central New York with a vision to translate their combined expertise in semiconductor design and production to develop new energy-efficient technologies in LED lighting. Casper sought out Ed Bogucz at SyracuseCoE, who in turn connected the Caspers to a broad array of resources, including business incubation, potential research and development collaborators, and other services to develop, test, and commercialize their innovative, energy-efficient lighting products. In 2012, Ephesus won a Commercialization Assistance Program award from SyracuseCoE that enabled the company to develop its own patented LED chip using gallium nitride on diamond. Subsequently, Ephesus developed an LED light for sports arenas that was installed at the historic War Memorial Arena at The Oncenter, home of the Syracuse Crunch of the American Hockey League. In 2014, Ephesus developed a next-generation light suitable for large stadiums; the performance of the first prototype was tested successfully at SyracuseCoE headquarters in May. The first installation of the new light was the University of Phoenix Stadium, which hosted the Super Bowl in February 2015. That exposure led to a jump in sales. “Ever y new venue will be built with LED,” says Casper, adding that stadium and arena lighting is just one aspect of business. Ephesus has also developed lighting for industrial and commercial use and for broadcasting. And that’s just the beginning. “The intellectual collisions that happen at SyracuseCoE spawn a lot of new ideas,” says Casper. In October 2015, Ephesus Lighting was purchased by Eaton Corporation, a global technology leader in power management solutions. As advances in instrumentation, mobility, production processes, and networks make data more prevalent within manufacturing, the integration and modeling of information from across these varied sources is becoming a critical differentiator for improving process productivity, quality, asset reliability, EHS and energy performance. Although many technology providers have their own applications to access and store the related data, it is often only available to meet very specific and limited functional needs. When data is recognized as a critical asset and managed as part of an infrastructure, however, it can become a key enabler to help transform the entire operations. By making all process and production data available, and providing information in a context model based on functional needs, manufacturers can drive improved results against their critical business impacts. This presentation will introduce the concept of a data infrastructure and show how a related strategy can help deliver operational intelligence to enable real-time action and decisions, provide a common platform for analysis, and establish standardized KPIs to measure and evaluate ongoing performance. 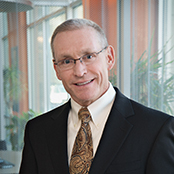 Lance Fountaine joined OSIsoft in October 2013 as an Industry Principal for the Metals and Mining industry following a 20 year career in the aluminum business with Alcoa Global Primary Metals. In his last assignment before leaving Alcoa, Lance was accountable for the global development and deployment of common, best practice Manufacturing Applications, as well as the supporting computing infrastructure. The renewed focus and resulting strategy led to the adoption of a SMART Manufacturing program across the global enterprise. This program was based on the PI System as an information infrastructure to support efforts for continuous improvement, operational excellence and ongoing business sustainability. After joining Alcoa as an electrical engineer in 1993, Lance held a number of positions within the company providing process control, manufacturing and IT services at the location, region and enterprise level. In addition to his technicalexperience, Lance has also led efforts to consolidate IT and OT functions into a common organizational model supporting the current convergence in computing technology. Lance was a Presidential Scholar at Clarkson University in Potsdam, NY. He graduated with a Bachelors of Science degree Electrical Engineering in 1991 and returned to get his Masters of Science in Electrical Power in 1993 as a research associate for Niagara Mohawk. Outside of work, Lance spends a majority of his time with his wife and two sons. He is very active in sports, and has also served as a coach for minor hockey, baseball and football in the Knoxville area. In addition to sports, Lance and his family also enjoy academics and traveling. This forum will be moderated by SyracuseCoE Executive Director, Ed Bogucz. Hunger, food security, climate emissions and water shortages are anything but foolish topics. The way we systematically waste food in the face of these challenges, however, is one of humankind’s unintended but most foolish practices. 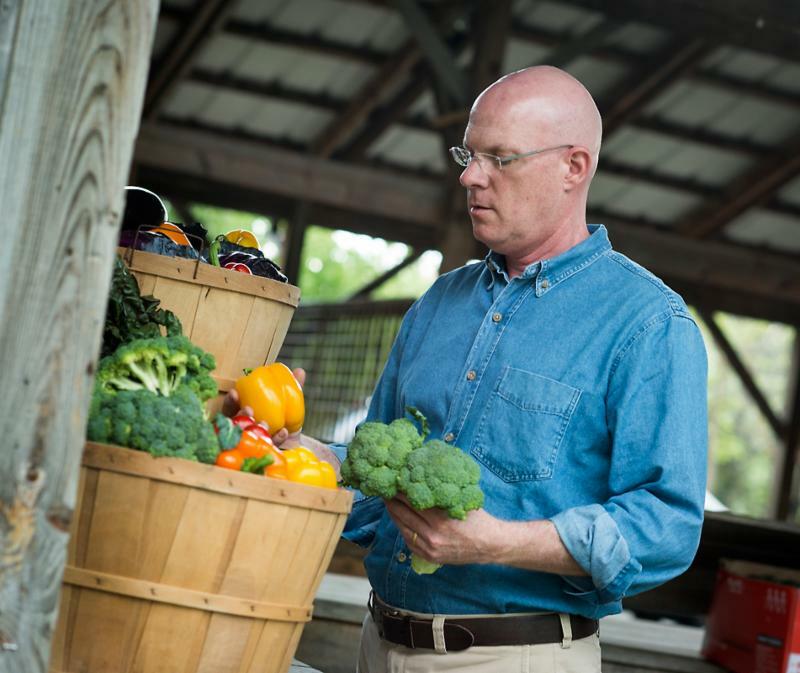 During his presentation, John Mandyck will explore the environmental and social opportunities that we can create by simply wasting less food, as highlighted in his recently released book Food Foolish. Real solutions to feeding the world and preserving its resources can be unlocked in the context of climate mitigation. 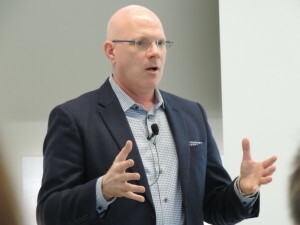 During his presentation John Mandyck serves as Chief Sustainability Officer for United Technologies Building & Industrial Systems, the world’s largest provider of technologies and services dedicated to making buildings and cities more energy efficient, safe and secure. With more than 100,000 employees and sales in nearly every country, UTC Building & Industrial Systems serves customers with innovative elevator, escalator, heating, air conditioning, refrigeration, fire safety and security solutions from well-known global brands such as Otis, Carrier, Kidde and Chubb. In addition to sustainability, he leads the company’s marketing and communications function. A graduate of Syracuse University, John works with universities and organizations around the world to accelerate green building, such as the U.S. Green Building Council, which Carrier helped found and joined as the first member in 1993. John chairs the Corporate Advisory Board of the World Green Building Council, serves as chairman of the Board of Directors for the Urban Green Council in New York City and is a member of the Corporate Council for the Center for Health and the Global Environment at Harvard University. He was appointed by the U.S. Secretary of Energy to co-chair the Department of Energy’s Appliance Standards and Rulemaking Federal Advisory Committee. He has presented energy efficiency, sustainability and future of food strategies to audiences around the world. LC Drives of Potsdam, for a project to develop a key manufacturing process for a newly designed wind turbine generator. This wind turbine generator will help bring down the cost of energy from wind power. Solstice Power, of Syracuse, for to support the development of The Hybrid System, a renewable, low cost, on-site, combined heat and power solar technology, which will generate three times the electrical energy of traditional fixed, mounted flat-panel solar systems. NuClimate Air Quality Systems, of East Syracuse, to support independent testing and final product revisions for new a Vertical Stack Induction/Fan Coil Unit. This unit will be a direct replacement for current Vertical Stack Fan Coil Units in the light commercial and commercial market place and will consume no more than 25% of the energy of current products. 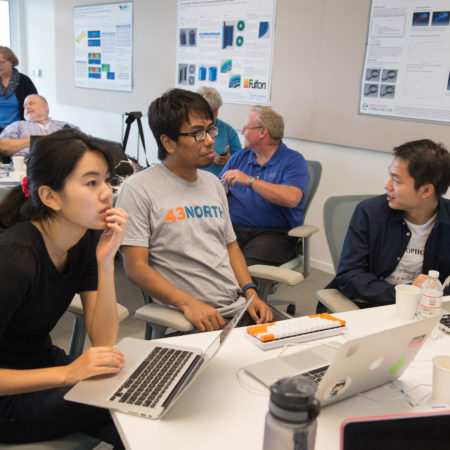 The SyracuseCoE Innovation Fund is supported by funding from SyracuseCoE’s Partner Program; it is designed to support Partners’ efforts to bridge barriers to the commercialization of potentially transformative innovations in energy and environmental systems. 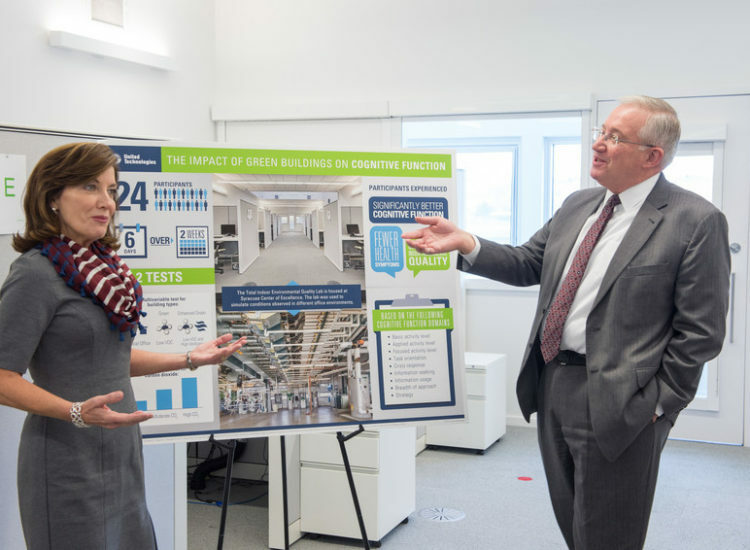 Projects must be aligned with commercialization of innovative products/technologies and focused on one or more of SyracuseCoE’s three core areas: Indoor Environmental Quality and Building Energy Efficiency; Clean & Renewable Energy; and Water Resources. To date, the Innovation Fund has provided $164,000 to nine yracuseCoE Partner firms for projects to develop innovative products and services and promote their commercialization. The next round of the SyracuseCoE Partner Program Innovation Fund will open in August of 2015. Eligibility for awards is extended to members of the SyracuseCoE Partner Program. Proposals may include collaborations with non-Partner Program firms and academic partners; however, proposals must be submitted and led by members of the SyracuseCoE Partner Program. Optimizing Dynamic Thrust: What Would Nature Do? The biomimetic approach seeks to incorporate designs based on biological organisms into engineered technologies. Biomimetics can be used to engineer machines that emulate the performance of organisms, particularly in instances where the organism’s performance exceeds current mechanical technology or provides new directions to solve existing problems. In this R&T forum, our speakers will explore how nature addresses propulsion in air and water and how those insights can be used to improve technological performance. The presentation will outline the solicitation, as well as the proposal submission, award and contracting process. PON 2606 seeks proposals for development and demonstration activities that advance the energy performance of both new and existing buildings in the residential, multi-family or commercial sector. Technology areas of interest include, but are not limited to: construction materials, strategies and practices; HVAC and lighting technologies, automation technologies enabling load flexibility and smarter background operations; and building integrated renewable energy systems. Energy improvements in buildings can also result from activities that do not involve development of new products or construction methods; improvements can result from new policies, regulations or assessments. NYSERDA also seeks proposals for activities to remove inadvertent barriers that hinder the wider use of promising technologies. Extra terrestrial manned exploration poses many immense challenges and opportunities. Key among them will to maintain acceptable indoor air and environmental quality. Although no specific mission has been scheduled, NASA and others are working on several solutions to these problems. In this presentation, the author will present a brief on the challenges in designing systems for space IAQ, and specifically discuss the technology he has been developing for NASA. Predicting the actual performance of filter media commonly used to remove gases in air cleaners is challenging due to low concentrations of contaminants that are typically found in indoor environments. The procedure specified in ASHRAE Standard 145.1 addresses these challenges by conducting tests of filter media at elevated gas concentrations. This approach is useful for comparing the performance of different media, but it cannot directly represent the performance of air cleaners in typical indoor environments. A new method was developed to determine filter media performance under low concentrations. Results show that the new test method can dramatically reduce test times and the approach can be applied to predict the media performance in real-life applications with sufficient accuracy. Our built environment can shape our habits and choices, regulate our sleep-wake cycle, drive us toward healthy and unhealthy choices, and passively influence our health through the quality of our surroundings. The WELL Building Standard provides the opportunity to design and build with a human-centered approach, which ultimately supports the industry in comprehensively addressing human health. Learn what happens once a project is registered to pursue WELL Certification, how the on-site WELL Commissioning works, and why recertification is important. Dr. Crumm’s PhD work at the University of Michigan led to the founding of Adaptive Materials Inc. (AMI). AMI grew to become an alternative energy market leader and after attracting more than $50 million in contracts was acquired by Ultra Electronics Inc.. Crumm’s simple, yet radical, business proposition was to develop a portable solid oxide fuel cell system that ran off of readily available fuel. Prior to founding Adaptive Materials, Crumm gained insight into electric power generation as a nuclear engineer. He earned his bachelor of science degree in nuclear engineering from Purdue University and a PhD in material science from the University of Michigan. 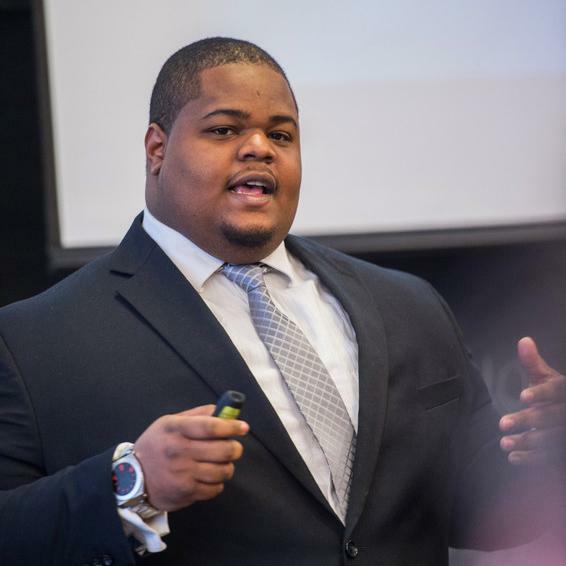 Crumm is a highly regarded and respected speaker at many alternative energy symposiums and fuel cell conferences, is an advisor at Augment Ventures and Entrepreneur in Residence with the University of Michigan Center for Entrepreneurship. Dr. Aaron Crumm – Founder, Adaptive Materials Inc. 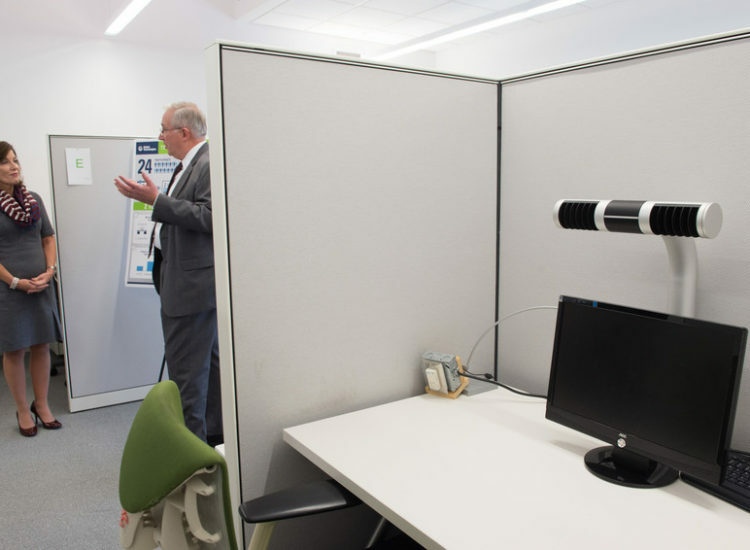 In a pioneering study conducted at SyracuseCoE by collaborators from Harvard University, Upstate Medical University, and Syracuse University, improved indoor environmental quality was found to double scores of knowledge workers on cognitive function tests. 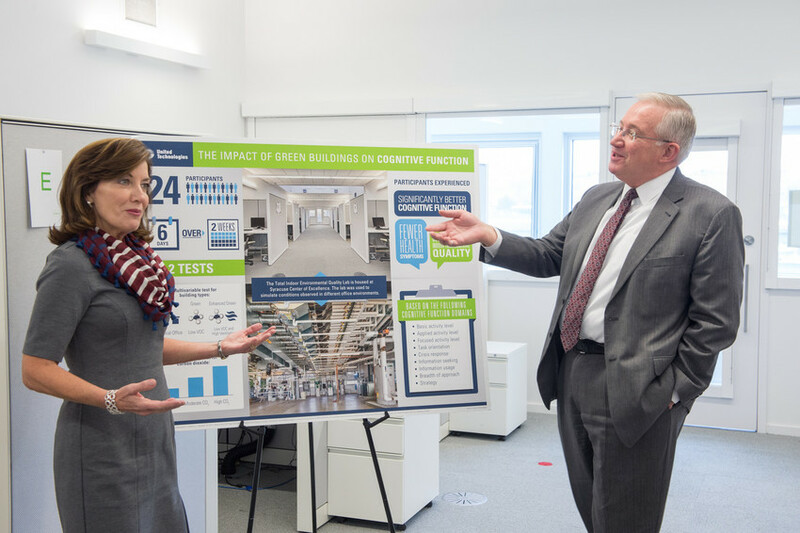 The study was conducted in SyracuseCoE’s unique Total Indoor Environmental Quality Lab, which was configured to conduct a double-blind study of 24 office workers who experienced indoor air quality conditions found in conventional buildings, green buildings, and green buildings with enhanced ventilation. A follow-up study was published last month that found that doubling the ventilation rate in typical office buildings can be reached at an estimated annual energy cost of between $14 and $40 per person, resulting in as much as a $6,500 equivalent in improved productivity per person per year. When energy-efficient technologies are utilized, the study found the energy costs to be even lower, with a minimized environmental impact of approximately 0.03 additional cars on the road per building. The full studies are available at www.CHGEHarvard.org/COGfxStudy and www.theCOGfxStudy.com. Designating hazard is an essential component of chemical alternatives assessment, a process which can lead to increased safety and sustainability of consumer products used in our homes and offices. Performing rigorous hazard analysis requires the evaluation of physical/chemical properties, environmental fate, and ecological and mammalian toxicity endpoints. However, the availability of relevant and high quality experimental data for the chemicals under consideration is the exception rather than the rule. Methodologies for addressing existing data gaps for hazard assessments often include the use of estimation methods such as Quantitative Structure Activity Relationships (QSARs), analogue approaches and read across, either used alone or in combination. Through the use of recent case studies, this presentation will focus on tools developed and/or implemented by SRC, Inc. to identify safer chemicals for consumer products, inform the decision-making process, and educate stakeholders. 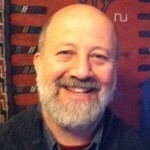 Dr. Jay Tunkel, Sr. Scientist and Principal Investigator from SRC’s Environmental Health Analysis (EHA) group. Dr. The U.S. Department of Energy’s Advanced Research Projects Agency-Energy (ARPA-E) has hosted the Energy Innovation Summit in Washington, D.C., for the past six years to bring together the very best minds in business, academia, and government to advance cutting-edge technologies that could fundamentally change the way we generate, use, and store energy. Having just returned from the Summit this month, R&T forum speakers will discuss SyracuseCoE’s engagement at the conference including a recap of how energy industry experts, thought leaders and decision makers are thinking about America’s energy challenges and how to move these innovations out of the lab and into the market. Additionally, Tim LaBreche will share highlights of a recent visit to Lawrence Berkeley National Laboratory. This year’s Super Bowl featured an epic game on the field, a stunning halftime performance, and—high in the rafters—a pioneering new lighting system that was developed with assistance from an EDA award for regional cluster development. The next-generation LED lights that lit Super Bowl XLIX at University of Phoenix Stadium were developed by Ephesus Lighting, of Syracuse, NY. Ephesus developed its new lights specifically for outdoor stadium sport venues with partnership support from the Advanced Manufacturing in Thermal and Environmental Controls (AM-TEC) program. AM-TEC was awarded EDA funding under the 2012 Advanced Manufacturing Jobs and Innovation Accelerator Challenge; it supports an emerging industry cluster in New York’s CenterState region. Ephesus Lighting is a shining example of the AM-TEC project’s vision for fueling growth and jobs in the region. The firm’s stadium lights achieve dramatic reductions in energy and maintenance costs, and improve experiences for athletes and spectators. And they’re raising the bar for high-quality sports lighting demanded by professional and collegiate venues. In 2010, company founders Joe and Amy Casper, created a company that envisioned translating their combined expertise in semiconductor design and production to develop new energy-efficient technologies. That vision resulted in a new company that targeted high-performance LED lighting. 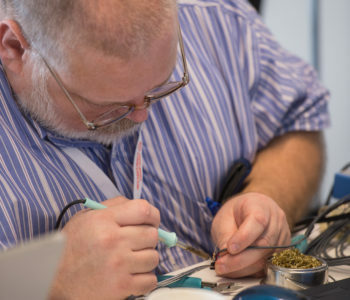 They tapped a broad array of resources available to start-up companies in New York State, including business incubation, research and development collaborations with area universities, and other services to develop, test and commercialize their innovative, energy efficient lighting products. In partnership with AM-TEC project partners led by the Syracuse Center of Excellence in Environmental and Energy Systems (SyracuseCoE), Ephesus Lighting demonstrated the first outdoor stadium prototype LED fixture using the SyracuseCoE headquarters facility as the testbed. To date, Ephesus lights have been installed at more than 100 sports venues across the U.S. and Canada. At University of Phoenix Stadium, home of the NFL’s Arizona Cardinals, 312 Ephesus fixtures replaced 753 metal-halide lamps, using 75 percent less energy and providing full illumination instantly, in contrast to the 20-minute warm-up period required by metal-halide lamps. With the support of EDA and others, Ephesus Lighting and its collaborators in New York’s AM-TEC cluster have demonstrated the benefits of leveraging regional assets and strengths, addressing new markets, and accelerating development of innovative, game-changing products. For more information about Ephesus Lighting, visit http://ephesuslighting.com. To learn more about the AM-TEC regional cluster project, visit http://amtec.syracusecoe.org. Central to SyracuseCoE’s mission, vision, and purpose, the SyracuseCoE Innovation Ecosystem encourages and funds collaborative projects that develop new environmental and energy systems products and services. Focusing on clean and renewable energy, indoor environmental quality, and water resources, these projects improve built and natural environments—the places in which we live, work, learn, and play. Grants are offered for targeted research, demonstration, and commercialization. In addition, SyracuseCoE outreach activities educate the public and the workforce—a crucial aspect of the green and clean technology sector. SyracuseCoE members leverage world-class R&D facilities, including the SyracuseCoE headquarters, the Building Energy and Environmental Systems Laboratory (BEES Lab) at Syracuse University, bio-fuels facilities at SUNY-ESF, full-scale wind turbine testing operations at Clarkson University, and more. Syracuse University was recently awarded a $3.2 million grant from the Energy Department’s Advanced Research Projects Agency-Energy (ARPA-E) to develop innovative new technologies that regulate temperatures for each person inside an office building, rather than heating or cooling the whole building itself. Syracuse University’s Professor H. Ezzat Khalifa will lead the team of researchers to develop a near-range micro-environmental control system. The system will provide heating and cooling via a box about the size of an old desktop computer. A high-efficiency micro vapor compression system will utilize an evaporator embedded in a phase-change material. This material will store the heating or cooling produced by the micro vapor compression system at night, releasing it as a breeze to make occupants more comfortable during the day. In addition to researchers at Syracuse University and SyracuseCoE, the project includes United Technologies Research Center, Air Innovations, Bush Technical LLC and Cornell University. Substantial financial contributions have also been given by Syracuse University, the partners, ESD (Empire State Development) and NYSERDA (New York State Energy Research and Development Authority). Prof. Khalifa and colleagues join the country’s top scientists and engineers in advancing ARPA-E’s mission of developing transformative energy technologies that enhance the economic and energy security of the United States. ARPA-E’s Delivering Efficient Local Thermal Amenities (DELTA) program plans to provide $30 million to support 11 project teams in developing technologies that can regulate temperatures focused on a building’s occupants and not the overall building. The team hopes to create an affordable system that can condition only the space immediately surrounding an individual user rather than all of the space in an office, saving a great deal of energy. Such an innovation could revolutionize the way offices are heated and cooled. Professor Godlewski examined the socio-political context of these groundbreaking pieces of art and architecture during the Renaissance and their renewed importance today. Bill Chadwick discussed​ Carrier Corporation’s recently completed innovative heating, ventilating and air-conditioning (HVAC) solution for the Vatican’s Sistine Chapel. The new system will help preserve Michelangelo’s masterpieces against deterioration caused by the increasing numbers of visitors. Research projects and opportunities related to stormwater management in Onondaga County. Khristopher Dodson – Assoc. Director, of the Center for Sustainable Community Solutions. Khris Dodson will offer an update on the Onondaga County Save the Rain green infrastructure projects, including a discussion of project goals and expectations. The Near Westside, Syracuse, NY. 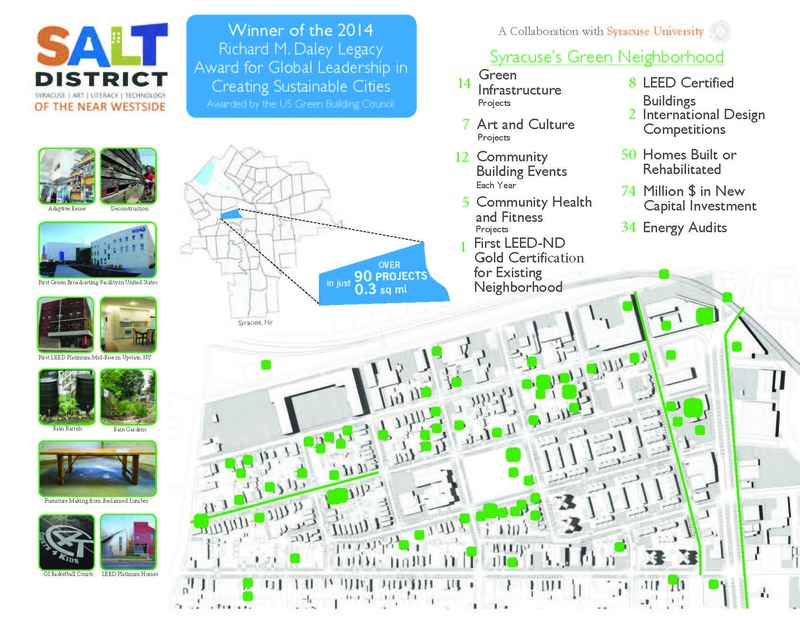 The Near Westside Initiative, a not-for-profit organization housed in Syracuse University’s Office of Community Engagement and Economic Development, has been named the 2014 recipient of the Mayor Richard M. Daley Legacy Award for Global Leadership in Creating Sustainable Cities from the U.S Green Building Council (USGBC). The award was presented during the USGBC’s annual Greenbuild conference in New Orleans on Thursday, Oct. 23. The bi-annual award celebrates the NWSI’s position at the forefront of sustainability in the built environment, and is named for former Chicago Mayor Richard M. Daley, who during his tenure made Chicago one of the most environmentally friendly cities in the nation. Daley was the first recipient of the award in 2010. “The NWSI was formed to holistically revitalize the Near West Side of Syracuse, to create a more vibrant and sustainable community for the folks who have lived here for generations, as well as families looking to relocate to Syracuse,” says NWSI Director Maarten Jacobs. The NWSI leverages the resources of Syracuse University, New York State, the City of Syracuse, Onondaga County, private foundations, businesses, not-for-profit corporations and neighborhood residents to achieve its goals. Since 2006, $74 million in new capital investment has been made in the neighborhood, with 90 projects comprising green buildings and infrastructure, arts and culture, community-building events and community health and fitness completed or underway in a 0.3 square-mile area. Three hundred and eight new jobs have been created in the neighborhood over the past eight years. The NWSI created the Syracuse Art, Literacy, Technology (SALT) District of the Near Westside as a creative community to foster economic development, jobs and stability for the neighborhood and rich academic experiences for Syracuse University students. This initiative brings together faculty and students with community activists and neighborhood residents on creative projects. The SALT District was the first existing neighborhood in the country to earn certification under the LEED® for Neighborhood Development rating system. To date, green accomplishments in the neighborhood include: eight new or renovated buildings that have earned LEED® ratings; 14 installations of green infrastructure for stormwater management; more than 50 homes either built or rehabilitated; and more than 30 other homes that received investments to improve energy efficiency. Projects including the From the Ground Up competition—which constructed three innovative green homes in partnership with the SyracuseCoE and Home HeadQuarters (HHQ)—have earned international recognition. • The Lincoln Supply Building, an abandoned commercial warehouse, was rehabilitated and is the first mid-rise multifamily building in the Upstate New York to earn a LEED® Platinum certification. The building now houses La Casita Cultural Center, a project of Syracuse University’s College of Arts and Sciences, and residential space. • WCNY, Central New York’s public broadcasting station, relocated from the Syracuse suburbs into a state-of-the-art broadcast and education center in a rehabilitated warehouse in the Near West Side neighborhood. It is the first green public broadcasting facility in the country. • Salt Works (http://www.saltworkssyracuse.com), is a social enterprise based on the Near West Side that uses reclaimed timbers from a rehabilitated warehouse to make furniture and put people to work. GreenTrain, a program to give local residents skills in green contracting, has also been held in the neighborhood. Fifty-seven residents have been trained and 87 percent have been placed in full-time jobs. • The neighborhood has served as a test bed for Onondaga County’s Save the Rain program. • Projects such as 601 Tully, the SaltQuarters artist in residence program and a community garden have brought art and culture into the neighborhood and built community. “The Near Westside Initiative Board of Directors particularly appreciates the leadership of Syracuse University Chancellor Kent Syverud, Syracuse University Community Engagement and Economic Development Vice President Marilyn Higgins, Syracuse Center of Excellence Director Ed Bogucz, Onondaga County Executive Joanne Mahoney, Home HeadQuarters Director Kerry Quaglia and Syracuse Mayor Stephanie Miner in making this achievement possible,” says NWSI Board of Directors Chair Paul Nojaim.